Join my mailing list for tips on people-centered leadership, EOS® implementation, and key leadership skills. Choose your subscription here. Do you believe your people are a fundamental part of leading toward growth? Get a free copy of my top 28 tips for developing as a people-centered leader. Click here to get your free ebook. After years of working with leaders to achieve growth through focusing on their people, I've compiled some of my most commonly given advice and tools in this book. 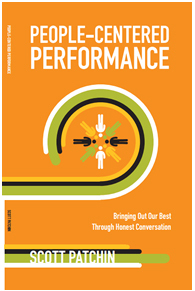 'People-Centered Performance' will help leaders improve team performance through honest conversations and thoughtful actions. Scott Patchin is an organizational and leadership growth expert, working with small- to medium-sized organizations across the U.S.
Scott specializes in the healthy growth and development of leaders, leadership teams, businesses, and talent/teams at all levels of the organization.